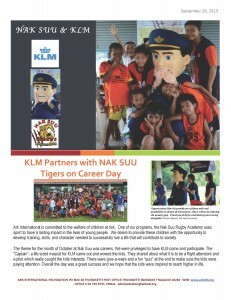 A big thank you to KLM for your invaluable support in getting behind our Nak Suu kids this weekend at the ‘Annual Predator Tournament’…Captain and the Air Stewardess helped with hamburgers, give awards, entertain children and brought happy smiles to all. Great turnout, the kids played hard and there was incredible volunteer support. A huge thanks to everyone who participated in order to make this happen…Ahmed and the Lions crew – you guys are legends. Appreciation to all for giving our kids opportunities they wouldn’t otherwise have. Ark International has been making some news with our new sponsor Double Tree Hilton Hotel. Check out the new media sightings below. Thanks so much Double Tree for partnering with us! Passion met with purpose. That’s what Jess Neilson, high school veteran rugby player from Victoria, Canada has once again orchestrated with great results. Nak Suu Tigers Cleat Drive Round 2 has brought in approximately 80 pairs of cleats for the children of Nak Suu Rugby Academy this year. That means between round 1 and 2, the drives have brought in a total of almost 200 pairs! Jessica is no stranger to overcoming obstacles and affecting change as she and her mom piloted an effort to change the Lower Island Middle School Sports Association policy of restricting girls at the age of 12 from playing on mixed rugby teams. Their efforts were successful after a final appeal as the LIMSSA now allows mixed gendered teams at higher ages. Because of Jess’s coordination of both cleat drives, children whose families cannot afford rugby equipment, are able to participate in the weekly rugby program safely with proper footwear. Thank you Jess, and thank you to each and every person who participated, not only in the cleat drive but who have shown care and support for the children of the world with your generous act of giving. What an exciting fundraising event – GO Bangers GO!! 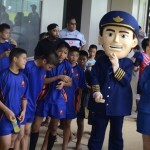 For the fourth year in a row Bangers on Bikes; a few brave, athletic men on bikes from the Old Bangers Rugby Club in Bangkok will be cycling all 956 kms from Phuket to Bangkok to raise money for charity. We at Nak Suu Rugby Academy and ARK International are honored to be one of the recipients of this auspicious undertaking. 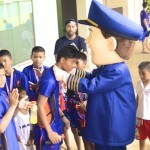 Donated monies to Nak Suu Rugby Academy are used for total running costs of the Academy. ARK International provides the transportation, equipment, as well as field rentals each week. Our future vision for the Academy and the children from the slum communities is to have a sport/learning complex where they can learn the value of team sports and have a facility where we can regularily provide a holistic approach to invaluable life skills. If you would like to sponsor the Bangers on Bikes fundraiser or are interested in more information, visit www.oldbangkokbangers.com or contact Bob Pearson – blp11@hotmail.com. To view or be a part of the Bangers on Bikes Facebook community click on the facebook icon below. Are you a Christmas Warrior? As with any ministry, we require the support of our friends and partners around the world to maintain our existing programs which enables us to stretch our loving arms around more and more children each year. For the past few years, at Christmas time, we have developed an annual celebration where we distribute gifts to each attending child from our focus communities. This gives us opportunity to encourage them with the true spirit of Christmas as well as share the Christmas story. Being from predominantly Buddhist families, this is the only Christmas the children know. This Christmas celebration takes a warrior network of volunteers and supporters during this holiday season as well as throughout the year. Warriors who are willing to serve, pray and provide. We would be grateful for any tangible way you can support our ministry. 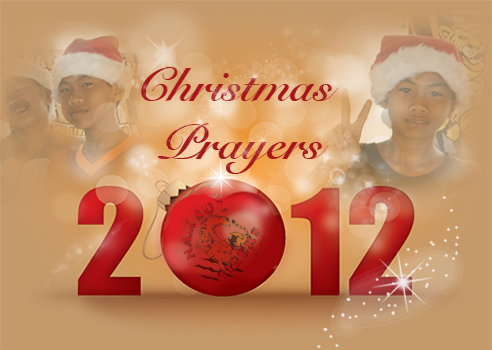 For more information about our gift program as well as volunteer or support opportunities available to you, click on the Christmas Prayers 2012 picture above.